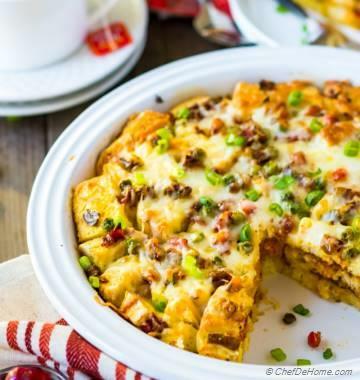 This insanely delicious cheese and egg scramble has everything you want from a perfect Monday morning breakfast! Let's get cooking! 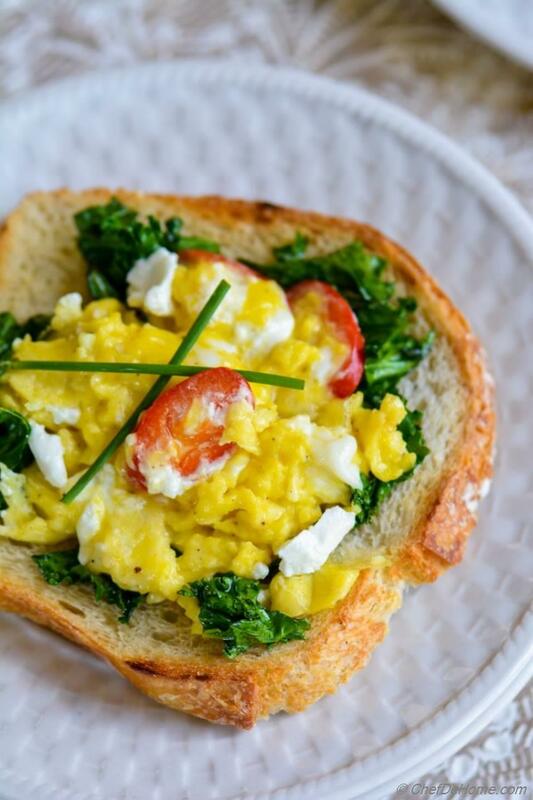 Starting Monday with scrambled eggs breakfast that has soft eggs, creamy layers of goat cheese, and hearty serving of sauted kale. 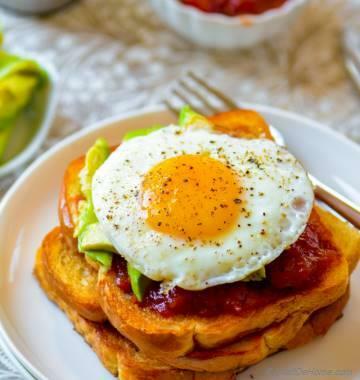 I think, Eggs and bread is most likely THE most popular and easy breakfast eaten all over the world. Preparation of eggs or spices might change but one thing remains the same - the aroma of eggs cooking in kitchen! 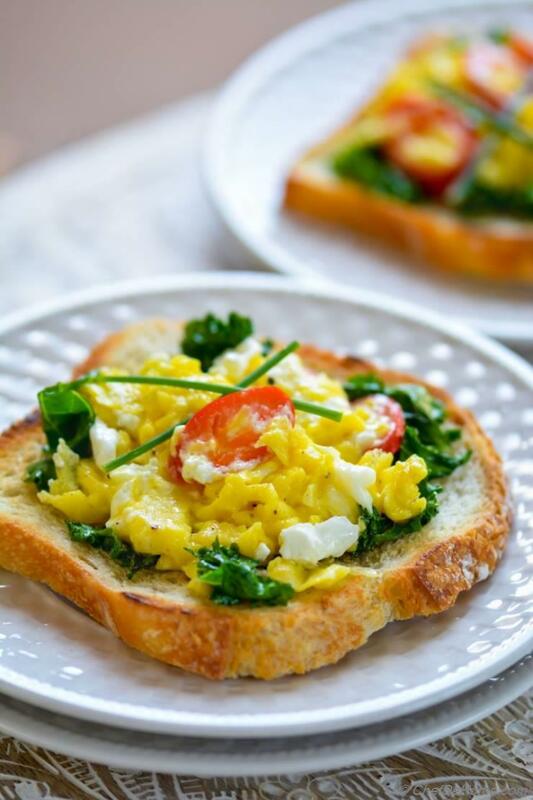 So, today I decided to add some cheese and healthy kale to this nostalgic morning staple.. and bring you an easy and delightful breakfast recipe. Greens such as kale or spinach not just add a serving of veggie to morning meal but also make it more substantial and tastier. This recipe is also great for weekend brunch. If you ever setup kitchen for make-your-own-breakfast... I recommend bringing some kale and goat cheese to the party. 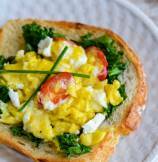 Kale can be sauted just like spinach and goat cheese is folded in once eggs are scrambled. Kids can skip fresno chili or replace chili with cherry tomatoes. Not only delicious this combination also looks pretty colorful. Isn't it? In my home egg and cheese is probably the only way Vishal will eat soft egg scramble. Thing is, in India-style scrambled eggs known as "Egg Bhurji", eggs are cooked hard and crispy and there is no sign of (not even remote) soft or runny eggs. Last year when we were visiting Seattle for Vishal's conference.... he tried eggs and cheese scramble with spinach and absolutely loved it. This gave me idea to serve something different for breakfast. I switched the spinach with kale... however, I often use either of the two for this toast. You know, I had plans to write so much in today's post.... but it's mid night while I'm typing this post and I'm super tired. No excuse... I know, I should not be because it was weekend, right? Weekend suppose to be time to relax and unwind but I have been super busy since Friday. So much so that I even missed talking to you on Friday. I'm hoping to buckle-up my schedule in few days and then share with you tale of my busy weekend. :) For now, let's head to the recipe! Oh, and remember to eat right, never compromise on flavor, and don't forget to bring some fresh colors in everything you eat. Because when you add color, veggies will naturally fit in your meal.... like super food kale, fresno, and chive in this goat cheese scrambled eggs. 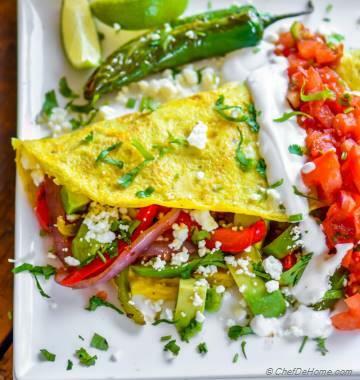 Whether you craving eggs or egg-less omelette, I got you covered! Total Time 15 minutes Prep Time 10 minutes Cook Time 5 minutes Difficulty Easy Yields 2-3 Servings Serves 2 Notes No. of servings depends on serving size. Smart Swap Replace fresno with cherry tomatoes for egg and tomato scrambled eggs! 1. If serving on toast, preheat oven at 350 degree Fahrenheit. Drizzle bread slices with some olive oil, and rub with cut cloves of garlic. Spread on a baking sheet. Toast in preheated oven until slight brown and toasted. You can also skip this step and toast bread in pan or in toaster oven. 2. In a bowl, add eggs with a tablespoon water and generous pinch of salt and black pepper. Beat well and set aside. 3. Heat 1 tablespoon oil in a pan. Add chopped kale, sprinkle generous pinch of salt and saute until wilted, water evaporated, and tender. (3-4 minutes). Remove in a small bowl. 5. Remove from heat. 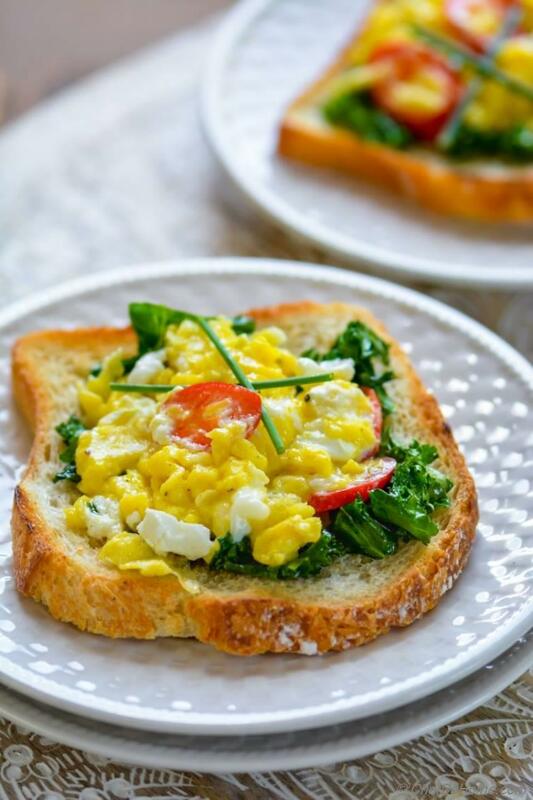 Layer each toast with some sauteed kale, scrambled eggs with goat cheese. Garnish with chives and serve immediately.